Hi friends! So I received an interesting question on my How to Make Stovetop Oatmeal video on YouTube (available on this how-to post) about chia seed colors. White, black, brown chia seeds – which should you get and which should you avoid? As I researched the question, it got me thinking maybe others had the same as well as related questions. As a result, I put together this question to answer your chia seed questions (hopefully!). Did you know the answer? Use these questions and answers to decide if you’re getting the right kind of chia seeds. Why Are Some Chia Seeds White and Some Black? Chia seeds are naturally either white or black. This is just how they grow. They’re not a solid color – more of speckle with some color variations. But if you were to see a bag of each side by side at the grocery store, you’d see they look different. These bags are commonly labeled as “White Chia Seeds” or “Black Chia Seeds”. Look for seeds that are either a speckled black or white, but not uniformly brown. The Chia Co. founder John Foss explains brown chia seeds are immature seeds that haven’t had a chance to mature properly, and this can result in fewer nutritional benefits and give the seeds a bitter taste. And for a fun fact, whilst researching I learned that the flower on the plant will tell you which color chia seed it will yield. Do White and Black Chia Seeds Taste Different? I’ve eaten both kinds…a lot. And to me they taste the same. Mostly because they don’t really taste like anything on their own. They sort of take on the flavor of whatever you’re cooking / eating them with. Is There a Difference in Nutrition Between White and Black Chia Seeds? The short answer is: not really. At least not enough for me to bother picking one or the other for nutritional reasons. While some slight differences in the protein content and omega-3 fatty acid composition exist between the black and white chia seeds, they do not significantly alter the nutritional value. Which Chia Seeds Should You Buy? So you’ve been reading about how chia seeds are SUPER-healthy and you MUST buy them now! But then you get to the store only to be confronted with two types. Which to buy? Which is better? Healthier? Tastier?! In the event you skipped the rest of this post, check the other sections for the answer to some of these questions. Black when I’m looking for convenience: From my shopping experience, black chia seeds are more easy to find. Many stores don’t even offer white chia seeds. So if I just want chia seeds to eat for the sake of eating / health, I’ll get these. White chia seeds for most recipes: White chia seeds seem to blend into colors of smoothies, etc easier. Since I do food photography, if I really want a green smoothie to pop color-wise, I’ll opt to use white chia seeds. White or Black Chia Seeds for Pudding? How Do You Eat Chia Seeds? I find chia seeds incredibly easy to use. My favorite ways are to cook them in oatmeal, add to smoothies, use as a topping for smoothie bowls, or make chia pudding. These are so easy you hardly need a recipe. But for those who want more direction, here are some of my favorite chia seed recipes in the next section. 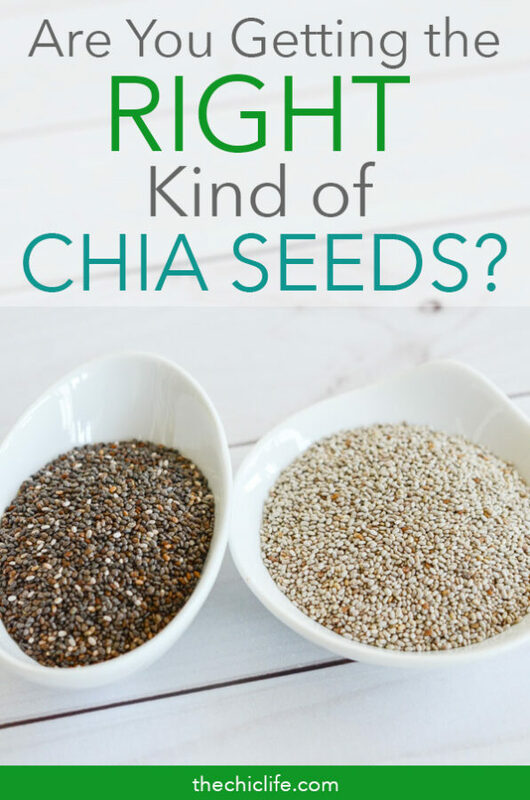 Thanks for reading this post with compiled research and my personal experience to (hopefully) answer the question: Are You Getting the Right Kind of Chia Seeds?